Sgt. 1st Class Justin Nelson, in charge of Soldier testing at Communications-Electronics Research, Development and Engineering Center’s Night Vision and Electronic Sensors Directorate, Fort Belvoir, Va., is suited up in the Nett Warrior System, with a helmet-mounted micro-display attached. Several new technologies are being developed that, once combined, will provide Soldiers an unprecedented overview of the battlefield. 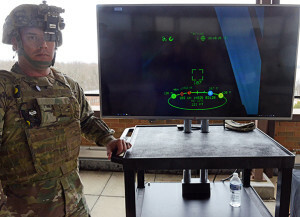 That assessment came from Army personnel at Communications-Electronics Research, Development and Engineering Center’s Night Vision and Electronic Sensors Directorate at Fort Belvoir, Va., who hosted a recent media visit. Those technologies involve the marriage of micro-displays with augmented reality. 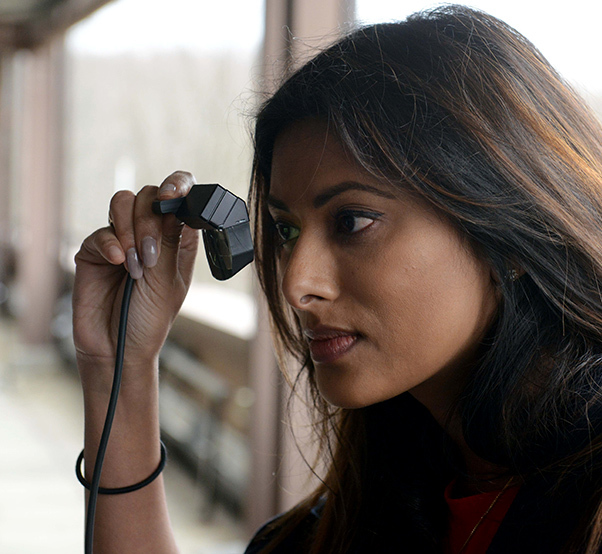 The Army’s preferred method of acquiring new technologies is to use what industry is already developing for consumers, or modifying that technology for its own use, said Rupal Varshneya, an electrical engineer at CERDEC. 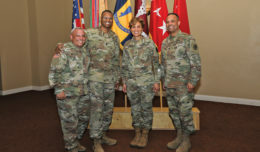 The Army employs its scientists and research laboratories for designing needed technologies that industry is not interested in pursuing, she said. Such was the case when the Army needed a very bright, high-definition micro-display, about the size of a postage stamp. First off, the Army approached makers of smartphone, tablets, TVs and even the gaming industry, she said. None of them were interested in making the micro-display because they didn’t foresee consumer demand or profit potential. So Army researchers at CERDEC went to work. David Fellowes, an electrical engineer at CERDEC, said researchers worked in stages building displays with progressively greater capability. About eight years ago, they developed a monochrome version. Rupal Varshneya, an electrical engineer at Communications-Electronics Research, Development and Engineering Center’s Night Vision and Electronic Sensors Directorate, Fort Belvoir, Va., looks through a micro-display. Then, several years later, researchers developed a new silicone technology and manufacturing methods that enabled the micro-display to increase in brightness, he explained. “If you’ve ever tried looking at your cellphone on a sunny day, it’s really hard,” he said. The increase in display brightness was such that Soldiers would now be able to see the tiny micro-display in sunlight. 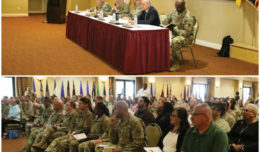 Although the technology was being developed for dismounted Soldiers, other program managers took notice, he said. For example the program manager responsible for Apache helicopters wanted their pilots to have them for head-mounted displays. They are not yet fielded for the Apaches, but a contract for them has already been signed. Other program managers wanted them for night vision goggles and even for weapons sights, he added. The next step, he said, was to develop an extremely high resolution, 2048-by-2048-pixel display in full color. That advancement came to fruition recently, and some of them were on display. The next phase of development had to do with taking the improved micro-display and pairing it with augmented reality, using the Nett Warrior system. Sgt. 1st Class Justin Nelson, in charge of Soldier testing at CERDEC, was suited up in the Nett Warrior System, with a helmet-mounted micro-display attached. The media could see what he was seeing in his micro-display on a large TV screen. The micro-display attachment to the helmet allows Soldiers to stay focused on what’s in front of them, he said. 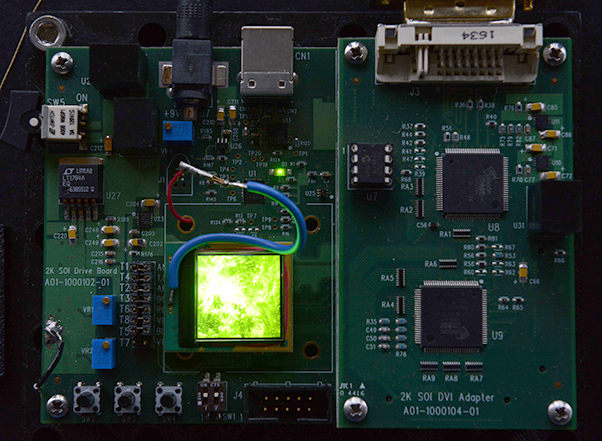 An early monochrome version of a micro-display developed by researchers at Communications-Electronics Research, Development and Engineering Center’s Night Vision and Electronic Sensors Directorate, Fort Belvoir, Va. The micro-display not only gives Soldiers a clear view of what’s ahead of them, night or day, it also can accommodate overlays such as maps and symbols showing friendly forces and enemy forces. In this way, it replaces traditional night vision goggles. 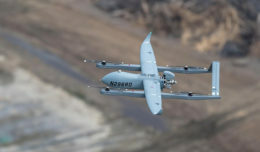 Furthermore, information that’s wirelessly fed into the micro-display, such as maps and symbols, can be shared among other Soldiers using the device, as well as leaders in the tactical operation center, he said. They all have the ability to share the same picture of the battlefield and can add or manipulate the symbols as needed, he said. Researchers are also adding micro-displays on the Soldiers’ weapons and feeding that display into the one attached to the Soldiers’ helmets via a tablet worn on the waist. That enables Soldiers to get a split view of what’s around them plus the target the weapon is trained on, he said. So if the rifle is pointed rearward and the Soldier is looking forward, the image shows both views, he explained, adding that creates novel ways for Soldiers to fire their weapons, such as shooting over a wall without being exposed. The entire system is currently being tested by Soldiers at Fort Benning’s Maneuver Center of Excellence, he said.